I like to draw and occasionally post junk. 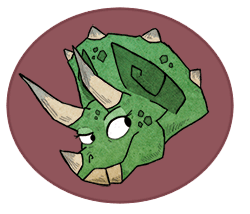 You can check out my personal art blog, REFRIGIGATOR!, if you want to see some of my stuff. Cute art, and love your avi! Thank you for choosing Chris Bluepaw Bazaar. Your comics are hecking amazing. Vote winged anti-early-christmas dino as most relatable character 2018! oh yeah, that's the one i wanted, but as i said there is no listing for it, thanks! !